We consulted a makeup artist for her top makeup tips for ladies in the 50s and beyond. 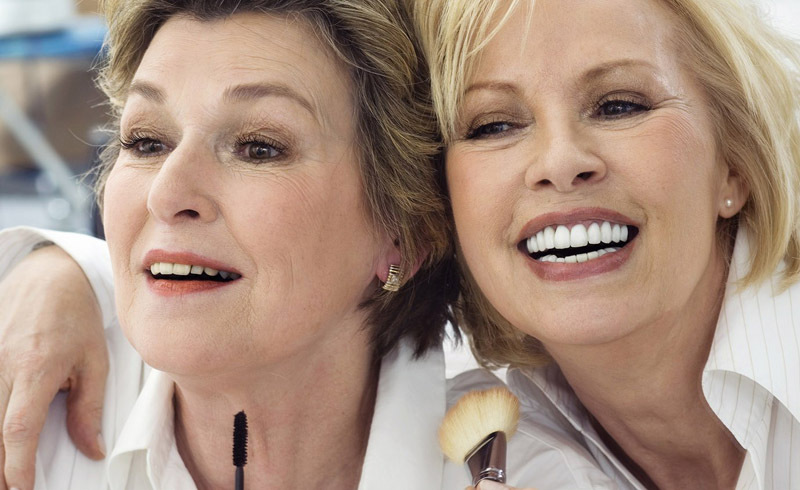 If you’ve ever found yourself googling "best makeup for older skin," you’re in the right place. We tapped Jenny Patinkin, veteran makeup artist (who just celebrated a milestone birthday herself), on how to use makeup to enhance your features. 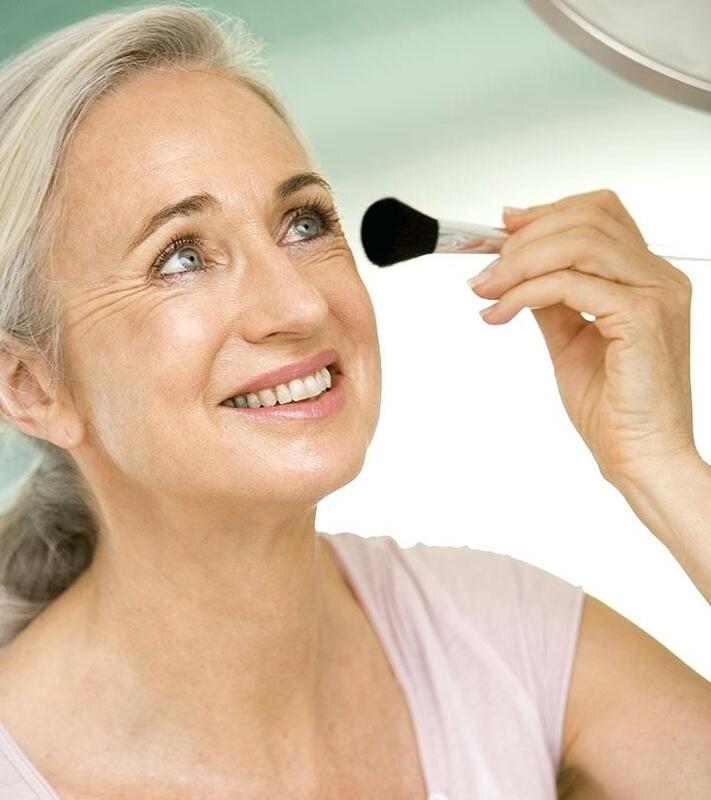 "If you’re experiencing age-related changes to the skin such as fine lines, discoloration and enlarged pores, it might seem logical to use extra makeup in an attempt to cover and camouflage, but that approach can backfire by accentuating things instead. I prefer to use a medium coverage foundation mixed with a few drops of liquid highlighter before buffing it into the skin with a soft, dense makeup brush. Thinning out your foundation this way gives you a dewy, brightening effect while still delivering coverage," says Patinkin. Under-eye concealer becomes increasingly challenging to apply as you get older. "For anyone who has crepey-ness and fine lines, using the least amount of concealer possible will always look better and wear longer since it’ll be less likely to crease. Additionally, it’s crucial to use a beauty tool that does not stretch or tug at the delicate skin around your eyes during application," advises Patinkin. "Highlighter can look incredibly flattering on lived-in skin since it gives the impression of hydration, brightness and lift. However, I do caution women with more mature skin to opt for a cream highlighter rather than a powder. The emollients in a cream create a barrier between the skin and any shimmery particles, preventing them from sinking into and accentuating fine lines," says Patinkin. "Having long, dark eyelashes can help camouflage any age-related issues on the eyelids by creating a curtain-like effect. I like to use what I call my ‘Press Wiggle and Fluff’ technique to really boost their darkness and density. To do this, I prefer a mascara with a smaller brush so I can easily press it right into the roots of the lashes to lift and curl, before wiggling it back and forth to darken and fill all the gaps between the lashes and fluffing them upwards to create length and density," says Patinkin. The darkness at the roots helps to define the shape of your eyes and makes your whites appear brighter, while the added length creates a drape over the lids. Win-win. And a final note from Patinkin: "So many of us over the age of 50 end up with a color differentiation between our face, neck and décolleté, simply from having lived our lives. With all of the amazing skin-care products and aesthetic services available to us now, it’s very easy to correct and even out the pigments on our face, but we often forget about our neck and chest. But I find that a very fair, milky toned face on top of a more discolored, freckled neck and décolleté makes the extent of our skin-care efforts look both obvious and incomplete. I always find that using a good bronzer will bridge the discoloration gap. Pick one that matches the deepest part of your skin and apply using a soft fluffy brush."